I wanted to make a 4th of July cake to impress but with limited time I used Betty Crocker white cake mixes. I used a 14 inch round pan. I made three layers one red, a white and blue layer. While following the instructions on the cake box I added a small box of strawberry gelatine for flavor and color. I left the white layer as is and I added blue food coloring and some blue sugar sprinkles into the mix. I used whipped cream frosting since it's lighter and not as sweet. Using the star tip I piped stars all around and to finish it off I bought a 4th of July party hat from the Dollar store and a star pin for an extra touch. With the left over frosting I baked a quick batch of sugar cookies which the kids loved. It was definitely easy, fun and yummy at the same time. This was a great cake during our patriotic celebration party. The thought you put into creating the cake was grand. The three different cake colors love that theme. GREAT CAKE! That is very cute! What a great job! Join in and write your own page! It's easy to do. How? 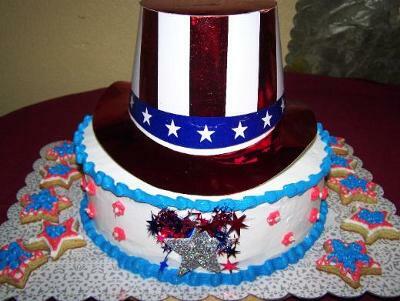 Simply click here to return to 4th of July Cake.